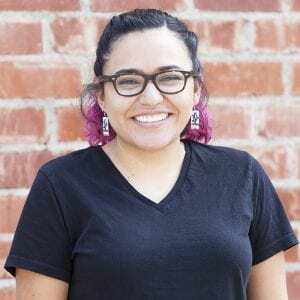 Born and raised in South Central Los Angeles, Karina Mata received her Bachelor of Arts degrees in Film and Media Studies and Sociology from the University of California, Irvine. Among some of her passions are taking pictures with her grandpa’s Polaroid Land Camera, helping her niece reach her goal of attaining one hundred subscribers on her YouTube channel, and encouraging youth to discover their fullest potential. Outside of her role as the Visual Arts Studio Assistant, she is also a volunteer mentor with Las Fotos Project, where she has introduced photography to a group of high school students and shown them how it can be used for visual communication and building critical thinking.